Today we completed the installation of a new ClipperCreek L2 EVSE at the Earthshine Nature Programs/Trails Science Education Center! 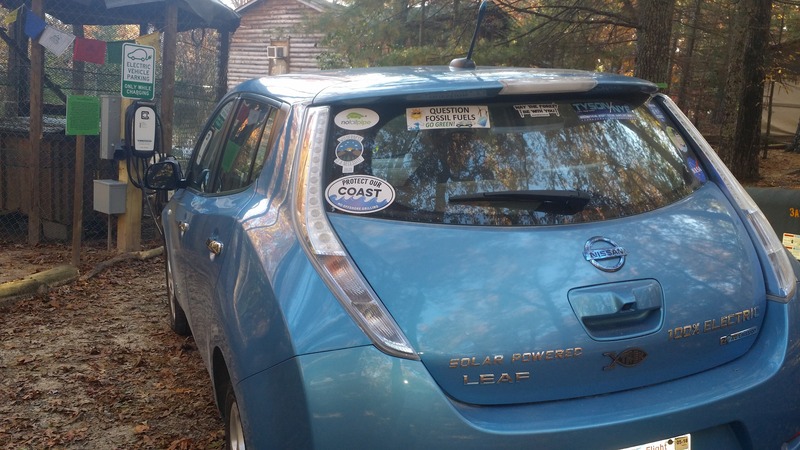 This “Zero Emission” EVSE receives its power from a student-built 4.8kW photovoltaic solar array and charges the ENP Nissan Leaf – our 100% electric solar-charged, zero-emission, outreach and wildlife rescue vehicle! This amazing combination of solar, EV, and L2 EVSE has allowed my students and I, working with Black Bear Solar Institute, Pineshore Energy, ClipperCreek, The Smoky Mountain Institute, and many more truly wonderful project supporters, to design a one-of-a-kind teaching tool for my middle, high school, and college age students and other visitors to our log cabin classroom. Every day, students and visitors to the Earthshine Nature Programs/Trails Science classroom will now encounter technologies we like to call the “new normal.” These powerful technologies enable us to produce, use, and monitor the clean, renewable energy we produce with our solar array – clean energy that will reduce our dependence on fossil fuels and improve our environment, benefiting us all. We are using our new solar array to supply clean power to the classroom and to the ‘smart’ ClipperCreek EVSE that Steve plugs into daily to charge the totally electric Nissan LEAF he drives as a daily driver to get to work and as an outreach vehicle for his nonprofit organization – Earthshine Nature Programs. This unique Level 2 EVSE EV charger contains cutting-edge technology that will make it part of a ‘smart’ network and soon we plan to add battery storage and integrate these systems—solar electricity generation and storage, EV charging, and classroom/nature center energy use. These systems will connect to a cloud-based platform that will enable us to monitor and control , from anywhere on the planet, our smart EVSE and shift electricity to where the demand is. Our students will be able to observe and interact with a complete state-of-the-art system for energy production and management. We at the Earthshine Nature Programs/Trails Science classroom are on the leading edge of the “new normal,” and our students are learning about the future of energy NOW! Special thanks to ClipperCreek, Dave Thompson of Pineshore Energy, Bob Harris of Black Bear Solar Institute, Jim Hardy, The Smoky Mountain Institute, Trails Carolina and Trails Momentum, and our students, for making this amazing forward-thinking project happen.